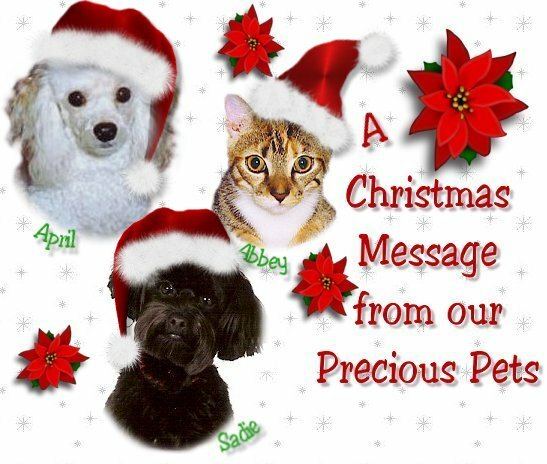 Here at the Christmas Cottage our furry family members are very important to us. And we know how important your pets are to you. With that in mind, we wanted to take a moment to pass on this holiday reminder of the hazards to our pets during the celebration of this season. Ribbons - No matter how cute it might look, placing a ribbon around your pet's neck may cause them to choke. Bubbling Lights - Older forms may contain methylene chloride, which is a highly toxic chemical. Fire Salts - Contains chemicals that could be harmful to pets. Angel Hair (spun glass) - Can be irritating to pets eyes and skin, and could cause intestinal obstruction if eaten in large amounts. Ornaments- These can look like toys to cats and dogs, but they can cause serious injury, especially if your pets break or swallow them. "New Year's Celebration Pet Hazards"
Balloons and Confetti - These party decorations can cause your pets to choke or obstruct their intestines if ingested. Loud Noises - Always remember that loud noises startle and frighten pets. Because these noises could cause them to run off, you may want to keep them safe in a separate room. This information was extracted from an ASPCA flyer. For a complete list of year round pet hazards, you can contact the ASPCA. If you think your pet has been exposed to a poisonous substance, the ASPCA Center may be able to help. You can reach them at 1-888-426-4435, and of course, be sure to contact your veterinarian.